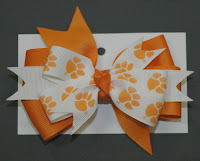 Clemson Girl: Shop Kidsville Boutique now online and dress your little Clemson Girls! 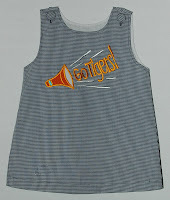 Shop Kidsville Boutique now online and dress your little Clemson Girls! Remember when I posted about Kidsville Children's Boutique a month ago (has it really been a month)?? 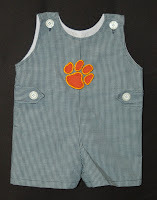 Kidsville Children's Boutique is a Clemson alum owned business in the upstate that sells the cutest outfits for your little tiger fans. Well..good news... now you don't have to live in the upstate or be in town to shop all of their adorable items - from smocked dresses, jumpers, and monogrammed outfits to custom hair bows, crocheted booties, and handmade tutus! Kidsville Children's Boutique has just launched their official Web site where you can shop their store from the convenience of your couch. 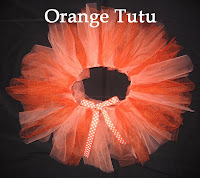 Your little ones will be the cutest Clemson fans at the games in some of these outfits - what little girl would not LOVE to be in the adorable orange tutu (I want one - do they come in adult sizes)?? Here are a few pictures to give you an idea of their products... I'm really digging this tutu! Also, now through October 4th, you can get free shipping if you spend more than $30 - use the coupon code FREESHIP. 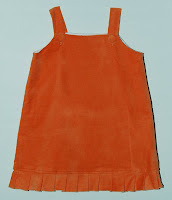 So start your Christmas shopping early and check out Kidsville Boutique's new Web site! I had Claire (15 months) in a Kidsville outfit at the Maryland game this weekend, and we got soooooo many compliments on it.